If you're in the market for a new car, you may be paying close attention to some of the more modern features than can improve your driving experience. 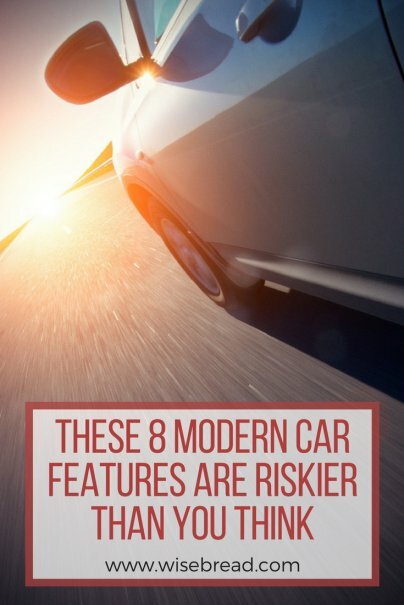 While some newer car features improve the safety and convenience of your vehicle, others can make your ride more dangerous. Here's what you need to know to stay safe with modern car add-ons. Air bags provide a significant improvement to vehicle safety overall, but there are certain situations where they present a hazard. Air bags can be dangerous to children or adults of short stature due to the close proximity of shorter individuals to the front bag when it deploys. To reduce risk of injury, seat shorter folks in the back seat, or adjust the front seat to a position further away from dashboard. Keyless ignition is a convenient feature that allows you to start your car remotely. A keyless ignition fob allows you to press a button and transmit a radio signal to start your vehicle. But this convenience can come at a dangerous cost. Without the need to turn a key or actually sit in the car, it's easy to forget that the engine is running. You may inadvertently create a carbon monoxide hazard in a garage or other enclosed space. Always check that the engine has been turned off when you exit the car. That big screen on the dash that runs the climate controls, shows you a map, and controls your music can be a major distraction. Not only does the display catch your attention, but dynamic touch screens take a lot more focus to use than old fashioned knobs and buttons that you can learn to operate by touch from muscle memory. Touch screens have different menus for different functions and typically require the driver to look at the screen to see where to press, diverting attention from the road. Practice safety first by not using the touch screen while driving. Jacked-up vehicles have been trendy for quite some time, going back to the SUV craze in the 80s and the Hummer craze in the 90s. Driving a large vehicle that sits high above the ground provides a commanding view of the road, but handling can be compromised. Tall vehicles have a higher center of gravity and heavier tires, which results in a greater risk of rollover. Driving a jacked-up vehicle also poses risks to other cars on the road. Instead of meeting bumper-to-bumper in a collision, a smaller car might take the bumper of a jacked-up vehicle through the windshield, greatly raising the risk of serious injury or fatality. Much like with a jacked-up SUV or truck, placing heavy items on top of your car raises the center of gravity and increases risk of rollover. In addition, items placed on roof rack may become loose during transit, presenting a risk of injury to pedestrians or passengers in nearby vehicles. Finally, attempting to lift cargo up to a roof rack can cause back injuries. Styling can make an ordinary car look cooler and more expensive, but it can also make cars more dangerous. Dark tinted windows can reduce visibility for the driver, especially at night. This problem gets worse in cars that have lots of electronic displays that can create glare. Chunky pillars make vehicles look sturdier, but also make it harder get a good view of oncoming traffic or obstructions. Some expensive sports and luxury cars come with high-intensity discharge (HID) lights, often using xenon gas, that generate very bright light with a bluish hue. Some vehicle owners upgrade their standard headlights to HID to make their car seem more expensive. While bright headlights can improve visibility for the driver of the car equipped with them, the bright lights can produce glare and reduce the vision for oncoming motorists. Cruise control can make long distance driving much easier — just reach your desired speed, and you can set your cruise to maintain speed without working the accelerator. The problem with cruise control is that it tends to promote unsafe driving behavior and reduces reaction time. Drivers using cruise control tend to cruise right up on slower vehicles before making a quick lane change to pass. Be vigilant at all times while driving — cruise control is not autopilot. Cruise control can also be dangerous in slippery conditions that can result in the tires spinning out of control when there is not enough friction between the tires and the road. You should never use your cruise function in poor weather conditions. He has a Ph.D. in engineering and has written two books about saving money.